An in-depth and candid discussion with Christine Louise de Cannonville, B.A. ; MIACP; MTCI; MPNLP, CMH; CHyp. Christine has been a Psychotherapist and Supervisor of mental health professionals for over 20 years. 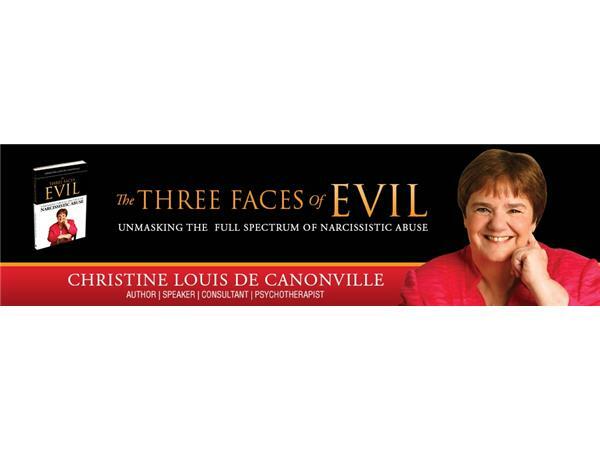 She has recognized a gap in the training of many therapists.Her book THE 3 FACES OF EVIL - Unmasking The Full Spectrum Of Narcissistic Abuse sets out to address the shortfalls in a therapist’s education so that they become better equipt to work with survivors of narcissistic abuse. It is her vision that narcissistic abuse becomes part of the curriculum of all Mental Health Professionals and other professionals (i.e. Psychotherapists, Social Workers, Police, Doctors, Solicitors, Law Courts, HR management, etc.) who deal with the fallout of this form of abuse.